Since first going into rehearsals in 1996 Manorhamilton based theatre company Splódar have been responsible for in excess of 40 productions and are now in the final stages of rehearsal for the upcoming performance of Eclipsed. The unique company has brought to the stage performancess in both English and Irish while some plays, such as Dancing at Lughnasa, have seen director and founder of Splódar, Prin Duignan, help stage the same production in both languages. Eclipsed, which will be performed in the Glens Centre from April 3-6 is set in 1963 and features an all-female cast. When first performed in 1992, it was the first time what unfolded inside the laundries was told publicly. Given that the story focuses on the harsh reality of life inside the notorious laundries it may have been expected that this is a deadly serious story with few laughs. However, Prin was quick to point out that the grim reality of life makes for some very funny moments, mixed with the darker side of life in the laundry. 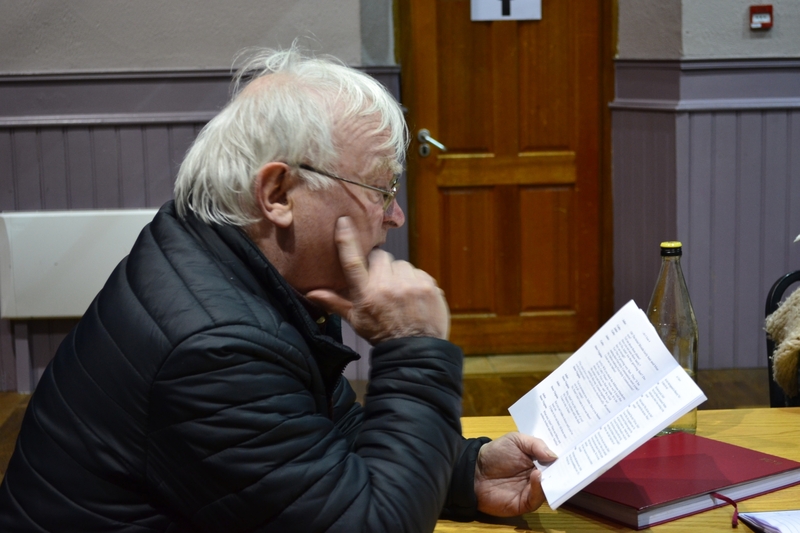 “It is extremely funny,” Prin declared as rehearsals were about to get underway in the Glens Centre last week. “They live in a pretend world and there is the codology of staging a wedding but they are only covering up the bad things. “You could call it a tragedy,” he added referring to one harrowing scene where a planned escape doesn't go to plan. When producing plays through Irish, the production is a fully professional one as it would be too difficult to source the acting talent otherwise. For Eclipsed, an English language production, Prin is not in a position to have such access to his cast of Niamh O’Brien, Treasa Nealon, Ava Murray, Mary Daly, Sheila O’Keeffe, Regina Fahey, Sarah Ferguson and Sinéad Sexton but nevertheless they are almost ready for the April performances. Commenting further on the group’s relationship with the Glens Centre Prin said: “The ethos is in keeping with the ethos of the founders of the Glens Centre. Written by Patricia Burke Brogan, Eclipsed, is an option on the Leaving Cert course and plans are afoot to tour the production throughout the country in the autumn. The group have performed in some of the best theatres around the country and Prin acknowledges the hard work put in over the years and the success of previous productions is a significant factor when it comes to seeking venues for upcoming tours. It promises to be a busy autumn for all involved with Splódar. They will be taking Eclipsed on the road nationwide while another play, The First Protestant, will be toured in venues throughout Northern Ireland. Written by local man Gerry Farrell, The First Protestant was recently brought to Dublin where it was staged to great acclaim in The Smock Alley. To book tickets to see Eclipsed from April 3-6 please contact The Glens Centre, (071) 9855833.